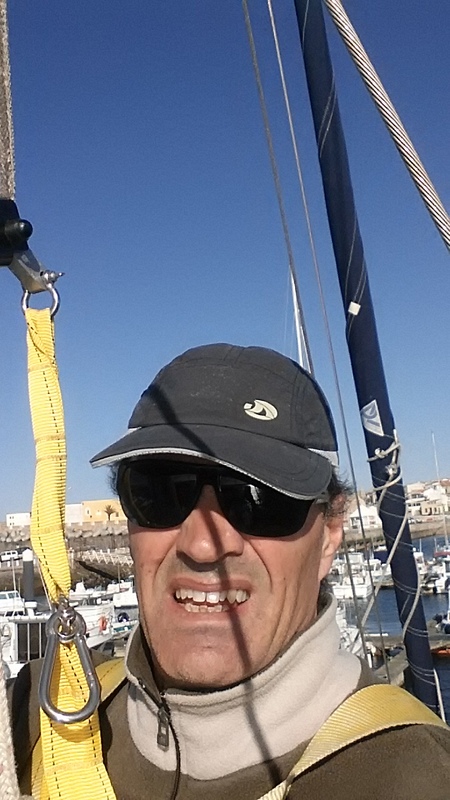 If you're bored reading yet another post about my mast-climbing heroics, just imagine how I feel. I'm the one doing the climbing, grunting and scraping! Funny thing is I like it. Everybody is asking (telling) me, "Why don't you take the mast down, lay it on some sawhorses, use some power tools, get it over with and act like a normal person?" To which I reply (or think to myself), "If I were normal, I wouldn't own a sailboat." What am I supposed to do in my spare time, learn to play cards? Besides, it's no big deal, another 50 or 60 hours dangling up there and I'll finish the job. I might even wax it in the end. If I were younger and keeping Jakatar for an extended period, after a good "up-and-down" sanding, I'd wet sand it every 3 years with penetrating oil and it would look flashier than a Los Vegas neon sign. I experimented using a 2000 watt heat gun and a scraper (Ryker's suggestion, the man knows everything, almost), and it worked really well. 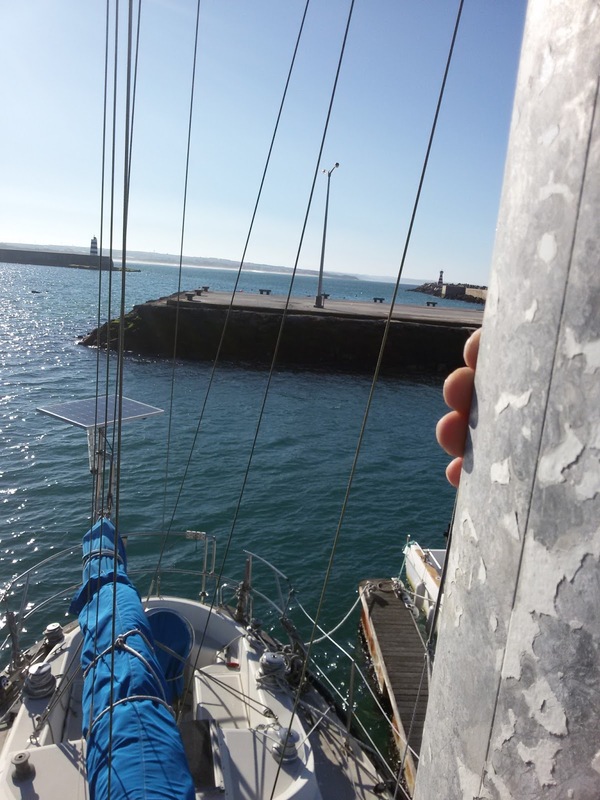 The mast barely warms up. The trick is to maintain the scraper's edge hot, you know, much like the hot knife and butter analogy. The heat gun is good for working at deck level, but higher up the mast swinging on the top-climber I'd surely burn my nose off sooner or later, and might even look better for it. This is a semi-finished section. The yellow blotches are etch primer that need to be sanded with very fine sandpaper, maybe 400 grit. I tried a green SOS pad (basically a dish-washing pad) but it didn't do the trick, it didn't do anything. A light sanding (always in the up-down direction) will bring it to a nice homogeneous shine. The blotches that developed under the paint must also be eliminated if it's going to look respectable. Skeptics may point out that I'll be wearing the mast away by sanding it. But, believe me, its a thick-walled heavy duty stick compared to the flimsy paper-thin masts on production boats. If I sand 500 grams or even 1 kg from the 50-foot mast, that means it will most likely last only 99.9 years instead of 100. 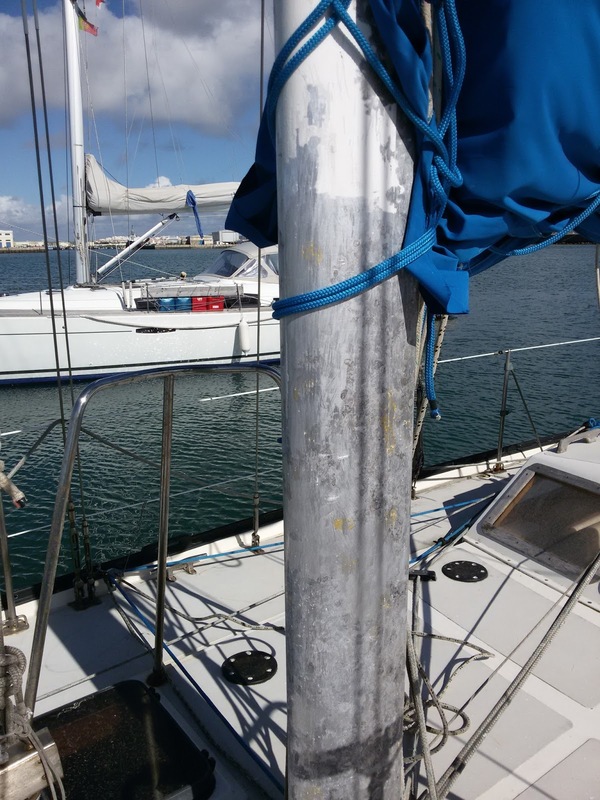 And it must be good quality aluminum too because previously scraped spots basically stay the same over time, almost like the bare hull of an aluminum sailboat. If it doesn't corrode or go black, why paint it? I've never seen a painted Ovni sailboat or their owners fretting about it. Look at that, from a short distance the bottom section, not yet finished, already looks like serious business. 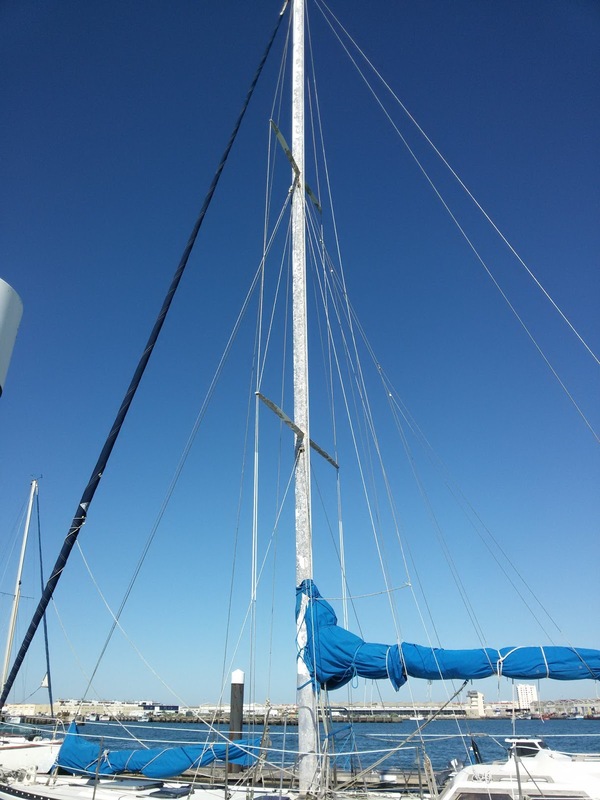 A real mast, a mast worthy of a tough blue-water sailboat. How people can live fulfilling lives without a boat is beyond me...unless they just fell in love or some dang thing like that. But then again, anything that makes sense is beyond me anyway, so no hard feelings. I've decided to buy another boat in the near future. A small production sailboat that will heel like mad with the wind in my teeth, a prayer in my pocket and just enough food and water to make it there, wherever that will be. I definitely don't want to die watching TV and eating croutons. If I don't fall from the mast first, that is. One thing for sure is that you've taken good advantage of your TopClimber! Spending so many hours up there must be rather therapeutic. Better than your head stuck in a bilge. I like the mast, alot. It has "serious" written all over it. So what's with the new boat. Have you got it lined up yet?? But you don't eat croutons while watching TV...you don't even have a TV!!! The new boat (as in about 17 years old) will likely be a Sun Fast 26. Hopefully a year from now when Jakatar's mast is totally scraped and the interior all "komacelled," and then I'll have two boats and surely go bust with a big smile!